I remember it like it was yesterday. A warm summer day, not long after I turned twenty, when everything I thought I knew about myself--my birth name, my family, my ancestry, even my medical history--was changed with a single word: "adopted." This week, as I read about the Ohio Department of Health redacting information from newly released records that Ohio adoptees are legally entitled to, I'm reminded of this time when I accidentally discovered that I was adopted. I'm reminded of the identity crisis it threw me into and of seeing my own medical and identifying documents being redacted. Looking at my own personal records that I obtained from my adoption agency, it was all too clear that these weren't just a few random scratches of ink that had been crossed-out, blacked-out, and covered-up. It was my life. And like so many of my adopted brothers and sisters, I remember my birth state telling me that, because I was adopted, I did not have the right to access my original birth certificate. It was a privilege to which I, like most Americans, had never given any thought. 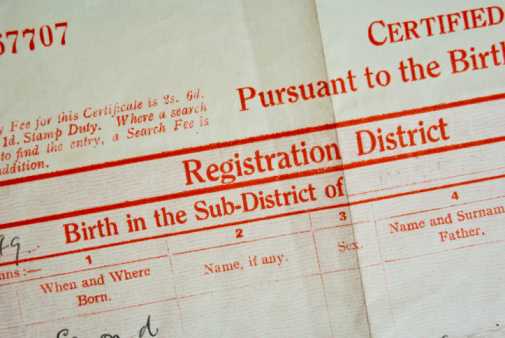 With legislation being signed last year in New Jersey, Connecticut, and Washington granting adoptees access to their original birth certificates and personal records, many might think such concerns are no longer an issue. But if this were true, why must we fight to have our voices heard? And why do the vast majority of states still deny most adult adoptees the right to access to their original birth certificates? This might seem like a lot of fuss over a piece of paper, but this is about so much more. This is about a fundamental right we all share: the right to know who we are, what we are, and where we come from. These are the building blocks upon which lives are built. Take them away, and what do we have left? For some, such information is the key to obtaining medical histories, which can impact family planning and help in the treatment of life threatening diseases. For others, it can be critical to connecting with their true heritage and safeguarding their cultural survival. That is why we need to pass legislation to protect adoptee rights across the nation once and for all. Yet critics worry, if adoption records were unsealed, that adoptees would harass birth parents and disrupt their lives. Still others worry that opening records will cause a rise in abortions and a drop in adoptions. But such fears remain unfounded. A 2007 report by the Evan B. Donaldson Adoption Institute found no evidence that birth mothers' lives were damaged by their information being released. Still other studies have shown that birth parents were never guaranteed lifelong anonymity and that very few biological parents wanted to keep records sealed. Most, in fact, want the opposite. Why deny adoptees their personal records and original birth certificates if it's against what most adoptees and their biological parents want? It makes no sense. It makes even less sense when we consider the broader implications: the more people are denied their rights due to circumstances beyond their control, the more likely they may be to treat others the same. Whether it's due to race, gender, sexual orientation, or the circumstances surrounding one's birth and adoption, discrimination fosters discrimination. If there's one thing we've learned from the advances made by the movements for women's rights, civil rights, and LGBT rights, it's that we can't eradicate discrimination against some people while allowing it to thrive against others. If we don't take real action to protect adoptee rights, we create precedent making it that much easier to discriminate against others. Adoptees come from every race, gender, and sexual orientation. We are your mothers and fathers, your sisters and brothers, your lovers, friends, and coworkers. In the U.S., we number 6 million strong, but our voices touch the lives of tens of millions more. Our rights are your rights. Your rights are our rights. And together we will be heard. DaShanne Stokes is a late discovery adoptee, author, speaker, commentator, and civil rights activist.